Like most serious tec divers, I read everything I can get my hands on related to the topic. I comb the Internet looking for anything new that will make my own diving a little safer. Naturally, there’s no shortage of opinion, and I am often stupefied by the things I see or read. As an example, look at the image to the left. This was on a website promoting a technical diving instruction program. (I censored the image to protect the identity of the diver, lol!) I can’t even count the number of things that are wrong. The equipment is wrong. The deco bottle is clipped in wrong. The deco regulator is stowed wrong, not to mention the octopus and extra hoses hanging off of it. The console, BCD, hose lengths, Air2, suicide clips… virtually everything, WRONG! Dangerously wrong! Beyond that, he’s holding onto the reef to make up for his obviously poor buoyancy skills. And his trim… The list never ends. The bottom line is he’s simply not ready for technical diving. Without a minimum level of precision, technical diving is just plain dangerous. So, bad example aside, if you are considering moving into tec, here are a few thoughts. There’s mystique in technical diving, and the idea of diving deep and claiming the label of “technical diver” is very attractive to some. However, not every diver is cut out for this kind of diving. If you are thinking about moving into tec diving, there are a few things you can do that will make your experience as safe and enjoyable as possible. It starts with your basic diving skills, so get in the water as often as possible. On your next dive, try the following. Run through all of the PADI open water dive skills and make certain that you have achieved mastery of all of them. Although hovering for 1 minute is the standard for PADI Open Water certification, on technical dives, you’ll need to hover at various stop depths for much longer duration. Decompression times well over an hour are not unusual. On your practice dives, pick a depth and hold it for at least 10 minutes. If you vary in depth by more than a foot or so, keep practicing. Take your mask off. Try reading your gauges without it. Get used to breathing without your mask in cold water. Swim around without it. Try to get to the point where you are as comfortable without your mask as with it. You don’t have to like it, but in the event you find yourself with a deco obligation and no mask, which can happen, surfacing just isn’t an option. Have your drysuit skills dialed. Long dives are almost always drysuit dives. You should be able to manage your buoyancy with absolute precision, so practice holding depths in midwater. Also, maintaining depth in shallow water is significantly more difficult than in deep water. I like the idea of being in about 30 feet, but not descending below, say, 10 feet, for an hour or more. Try it. Get into a set of doubles and take a test drive. Diving doubles is not difficult, but it can feel busy and out of control until you get a feel for it. Find a patient buddy and swim around in 10 feet of water until you have a feel for the weight and trim differences diving in doubles presents. If you find yourself struggling with any of the basic mask and buoyancy skills, do practice dives in shallow water until those fundamental dive skills are second nature. Whether it takes one dive or 100 doesn’t really matter. If you have the basics nailed, your first technical diving course will go much more smoothly. Another consideration when deciding to get into technical diving is how often you dive. There are prerequisites that include a minimum number of dives, Nitrox certification, Deep certification, etc., but also consider how much diving you really do (or will do). If you are a once or twice a year diver, mostly on vacation, the demands of technical diving may make sense to think about. The issue is technical dives are ceiling dives. In fact, most agencies define technical diving as dives made where a direct ascent to the surface is not possible. This could be a physical barrier as in a cave or wreck, or a ceiling imposed by a decompression obligation. 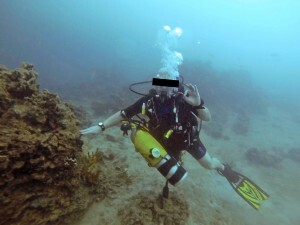 In technical diving, any problems must be dealt with underwater. A good technical diver practices a lot. We run scenarios, plan dives and repeat skills and drills constantly. This is because we know that failures do happen, and conditions change. Something as simple as isolating cylinders 10 seconds faster (or, at all) can mean the difference between having enough breathing gas to safely reach the surface, or not. For many of us, long deep dives are exciting. It’s not just the depth but the level of focus and satisfaction that comes with executing dives with precision. But, to make these types of dives safely requires more than earning the certification card. Think about your goals. Why are you considering technical diving? Your reason is as valid as mine or anyone’s. Just keep in mind that to be safe requires a level of commitment that exceeds that in recreational diving. Tec diving is risky. As technical divers, we subject our bodies to what amounts to experimentation and educated guesses with regard to decompression theory. It is an entirely different mindset compared to recreational diving, and you must accept the risks associated with that. For those who that are willing to practice and learn continuously, technical diving provides an opportunity to dive where others have never been, and to see things that few of us ever will. If this is you, go for it! Just don’t look like the guy in the picture. This entry was posted in Diving Safety, Technical Diving and tagged scuba instruction, technical diving. I totally Agree with your insights. Let me add this that a good diver has the passion and undying interest to learn and dive with heart. I´m Belinda from Scubacrowd.com. We are an online network for divers by divers helping people find all sort of information needed for scuba diving. We also help professionals get more visibility by listing them on our website. We are looking for contributors to write articles for our website and I found your blog wonderful. We are looking for interesting content to put on our Articles page and I was wondering if you would be interested in collaborating with us, I would love to discuss further details with you. Meanwhile you can already have a look at our website, sign up, share photos via Flickr, log dives as a user or even get your business listed for free as a professional! Drop me a note at joe@joescuba.com and let’s talk about it.